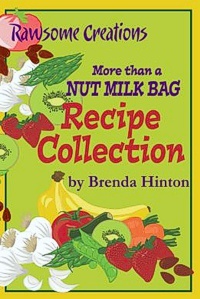 Our Original More than a Nut Milk Bag continues to be the most valuable player in our kitchen. 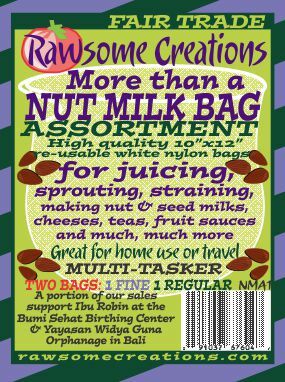 This reusable multi-tasker can be used for nut milks (Rawsome Recipe: Almond Milk) and straining juices. It's so much easier and faster than using a strainer. The drawstring means you can just hang it and let it do its own thing! NEW PRODUCT! 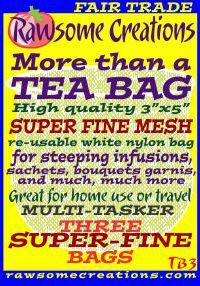 3 little 3"x5" superfine mesh bags perfect for brewing tea, steeping infusions, sachets and bouquets garnis, and so much more. 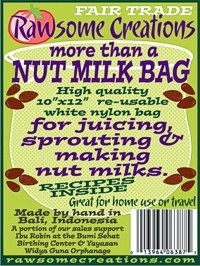 Same durable construction as our famous More than a Nut Milk bags. 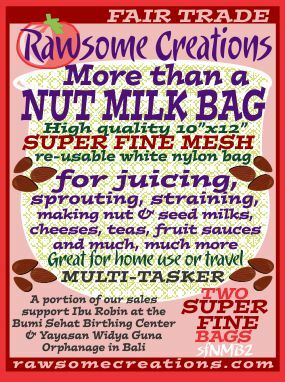 For velvety sauces and clear juices the new SUPERFINE More than a Nut Milk Bag'll do 'em! More delicate and tighter mesh. We have already found a dozen unexpected uses that make these bags indispensable in our busy living food kitchen. These started out as a mistake, but some of the best things start that way! 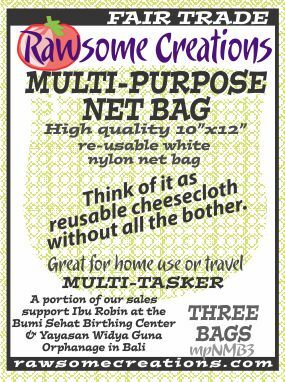 We have a limited number of our Multi-Purpose Net Bags made with more open mesh. We use them for straining large-grained products, and for storage when some air circulation is desired (as in drying beans). Husband Mike uses them to hold the hops when he brews beer, and a chef friend reports using them to keep a bouquet garni together in a soup or stew. What can you do with a More than a Nut Milk Bag? You’d be surprised! and this book answers that question with more than 40 tested and taster approved recipes. There's a tour of the book here on the website, and a selection of free recipes, to get you thinking.